A pink halo in the meat is a tell tale sign of the deep smoke on the spare ribs at Mike's BBQ. Reader: There seem to be lots of new BBQ places popping up around here these days. Which of these newcomers do you like best? Craig: Yes, there are some exciting smoke signals wafting above the city lately, with several more to come, and I can only say: Thank you! It’s about time we lit that fire. The current wave of newcomers have begun to fulfill my hopes that Philly — long an underwhelming BBQ scene — is finally about to grasp its new and improved smokehouse destiny. A platter of meats (pulled pork, chicken wings, and brisket), short ribs, cucumber salad, and cole slaw at the South Philly Smokhaus, in the Bok Building. The new energy puffing out of South Philly, in particular, is more than promising. I just gave a friendly two-bell review to South Philly Smökhaus (821 Dudley St.), a cool destination in the Bok Building where pit master Eric Daelhousen has taken over the industrial space of the former vocational school’s old auto body shop. He’s transformed it into a communal gathering place where the eight-foot-long “stick burner” smoker behind the counter of his open kitchen is turning out relatively unadorned, purist versions of oak-kissed, slow-cooked briskets crusted in char; juicy plumes of pulled pork, creative sandwiches (try the Bevy Club, made with pit beef and house bacon); and richly marbled slabs of prime-grade short ribs whose rustic crust and vivid pink smoke halos alone are worth the trip. As good as Smökhaus is, Mike’s BBQ (1703 S. 11th St.) near East Passyunk is even better — and my current BBQ favorite. I first was smitten with owner Mike Strauss’ smoked brisket cheesesteak, an essential new twist on the classic Philly sandwich. But I’ve since been back enough times to finally assign Mike’s a proper rating: a “high” two bells with a potential for more if Mike’s eventually grows into a larger, more interesting space (grease-free floors would be a plus), perhaps with a cool drink program to back it up. The smoked meats already are at a three-bell level, with that perfect combo of deep flavors, telltale pink smoke halos, and moist tenderness that sometimes eludes genuinely smoked meats. 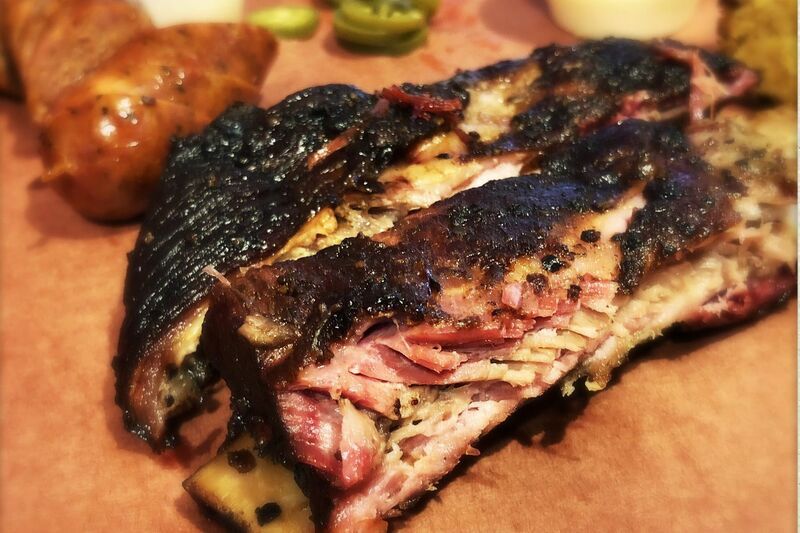 The juicy, spice-crusted Creekstone brisket, pork spare ribs, and pulled pork are about as good as Philly gets. And the other dishes here — the pulled pork-stuffed mac-‘n’-cheese balls, the house-made sausage links, the incredibly hearty chili brimming with smoked meats, and several other funky sandwiches — show Mike’s repertoire is not limited. One often overlooked newcomer across the bridge in South Jersey is Smoke BBQ in Audubon (34 W. Merchant St.), where owner Aaron Clark was inspired by his time in Austin for a legit, pepper-edged Texas-style brisket. The big hit on that menu, though, is the smoked pork belly tacos with mango salsa. I wish I could say similarly nice things about the relatively new Tradesman’s (1312 Chestnut St.) The service is friendly, but its weak-flavored meats were a letdown — including a pulled lamb shoulder that intrigued, but that unfortunately was as tough, dry, and fibrous as wool. Doug Henri turns out some of the best barbecue in the region at Henri’s Hotts Barbecue in Folsom. Of course, it’s not as though Philly didn’t already have some fine BBQ spots. I’ve long turned to reliable standbys like well-rounded Sweet Lucy’s Smokehouse (7500 State Rd.) in the Northeast, Henri’s Hotts in Folsom (1003 E. Black Horse Pike) on the way to the Shore, and Fishtown’s branch of Fette Sau. But this region has never had a cohesive BBQ culture or particular style of its own. That may never happen. But the pitmaster community itself is continuing to grow, with at least three more BBQ openings cued up for the coming months. There’s a new branch of Ambler’s Lucky Well coming to Spring Garden in March, featuring Memphis-style ribs and a live-fire charcoal broiler built in Texas. City Creek BBQ, planned for the end of February, will bring a restaurant component to Avram Hornik’s Craft Hall complex (901 N. Delaware Ave.) in the former Yards space (where Mainstay Independent Brewing Co. and Lost Bread Co. already are open).